SilverStateDrivingAcademy.com Service (the "Service") is a free computer online service. 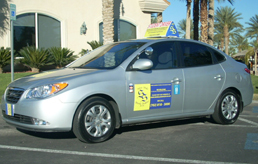 It is accessible to you through a personal computer, or other access device, at www.SilverStateDrivingAcademy.com using a communications connection (e.g., modem and telephone line). As part of our service, SilverStateDrivingAcademy.com will provide you information, including but not limited to, editorial content, chat rooms, links to other Web sites and other computer services that SilverStateDrivingAcademy.com may decide to offer, subject to the terms hereof. Upon notice published through the Service or otherwise, SilverStateDrivingAcademy.com may modify this Agreement at any time. You agree and continue to agree to use the SilverStateDrivingAcademy.com Service in a manner consistent with all applicable laws and regulations and in accordance with the terms and conditions set out below and in the "Rules of Conduct" that describe conditions for use of SilverStateDrivingAcademy.com chat rooms (collectively, the "Terms of Service"). 1. General Terms: By using the Service, you agree to be legally bound and to abide by the Terms of Service, just as if you had signed this Agreement. If you do not comply and/or continue to comply with the Terms of Service, SilverStateDrivingAcademy.com may terminate your right to access the Public Areas of the Service. Public Area(s) are those areas of the Service that are generally accessible to other users, such as chat rooms, message boards and file uploads. SilverStateDrivingAcademy.com may discontinue or alter any aspect of the Service, including, but not limited to, (i) restricting the time of availability, (ii) restricting the availability and/or scope of the Service for certain platforms (i.e., computer types and operating systems), (iii) restricting the amount of use permitted, and (iv) restricting or terminating any User's right to use the Service, at SilverStateDrivingAcademy.com sole discretion and without prior notice or liability. You acknowledge that the Service contains information, software, photos, video, graphics, music, sounds or other material (collectively, "Content") that are protected by copyrights, trademarks, trade secrets or other proprietary rights, and that these rights are valid and protected in all forms, media and technologies existing now or hereinafter developed. All Content is copyrighted as a collective work under the U.S. copyright laws, and SilverStateDrivingAcademy.com owns a copyright in the selection, coordination, arrangement and enhancement of such Content. You may not modify, publish, transmit, participate in the transfer or sale, create derivative works, or in any way exploit, any of the Content, in whole or in part. You may not upload, post, reproduce or distribute Content protected by copyright, or other proprietary right, without obtaining permission of the copyright owner. SilverStateDrivingAcademy.com and its logo are trademarks of High Desert-2000 Company. All other trademarks appearing on the Service are trademarks of their respective owners. 2. Public Area Rules: You will not engage in any conduct that in the discretion of SilverStateDrivingAcademy.com restricts or inhibits any other person from using or enjoying the Service. You agree to use the Service only for lawful purposes. You certify that you are an individual (e.g., not a corporation) and at least eighteen (18) years of age or have specific permission from a parent or legal guardian to use the Service. You are prohibited from posting on or transmitting through the Service any unlawful, harmful, threatening, abusive, harassing, defamatory, vulgar, obscene, profane, hateful, racially, ethnically or otherwise objectionable material of any kind, including, but not limited to, any material which encourages conduct that would constitute a criminal offense, give rise to civil liability or otherwise violate any applicable local, state, national or international law. SilverStateDrivingAcademy.com may elect to electronically monitor the Public Areas for adherence to the Terms of Service and may disclose any Content, records or electronic communication of any kind (i) to satisfy any law, regulation or authorized governmental request, (ii) if such disclosure is necessary to operate the SilverStateDrivingAcademy.com Service, or (iii) to protect the rights or property of SilverStateDrivingAcademy.com or its partners. SilverStateDrivingAcademy.com reserves the right to prohibit conduct, communication or Content which it deems in its discretion to be harmful to individual users or other third-party rights, or to violate any applicable law. 3. DISCLAIMER OF WARRANTY AND LIMITATION OF LIABILITY: YOU AGREE THAT USE OF THE SERVICE IS ENTIRELY AT YOUR OWN RISK. SilverStateDrivingAcademy.com's SERVICES ARE PROVIDED "AS IS," WITHOUT WARRANTY OF ANY KIND, EITHER EXPRESS OR IMPLIED, INCLUDING WITHOUT LIMITATION ANY WARRANTY FOR INFORMATION, SERVICES, UNINTERRUPTED ACCESS, OR PRODUCTS PROVIDED THROUGH OR IN CONNECTION WITH THE SERVICE, INCLUDING WITHOUT LIMITATION ANY SilverStateDrivingAcademy.com SOFTWARE LICENSED TO YOU AND THE RESULTS OBTAINED THROUGH THE SERVICE. SPECIFICALLY, SilverStateDrivingAcademy.com DISCLAIMS ANY AND ALL WARRANTIES, INCLUDING WITHOUT LIMITATION: 1) ANY WARRANTIES CONCERNING THE AVAILABILITY, ACCURACY OR CONTENT OF INFORMATION, PRODUCTS OR SERVICES; AND 2) ANY WARRANTIES OF TITLE OR WARRANTIES OF MERCHANTABILITY OR FITNESS FOR A PARTICULAR PURPOSE. THIS DISCLAIMER OF LIABILITY APPLIES TO ANY DAMAGES OR INJURY CAUSED BY ANY FAILURE OF PERFORMANCE, ERROR, OMISSION, INTERRUPTION, DELETION, DEFECT, DELAY IN OPERATION OR TRANSMISSION, COMPUTER VIRUS, COMMUNICATION LINE FAILURE, THEFT OR DESTRUCTION OR UNAUTHORIZED ACCESS TO, ALTERATION OF, OR USE OF RECORD, WHETHER FOR BREACH OF CONTRACT, TORTIOUS BEHAVIOR, NEGLIGENCE, OR UNDER ANY OTHER CAUSE OF ACTION. YOU SPECIFICALLY ACKNOWLEDGE THAT SilverStateDrivingAcademy.com IS NOT LIABLE FOR THE DEFAMATORY, OFFENSIVE OR ILLEGAL CONDUCT OF OTHER USERS OR THIRD PARTIES AND THAT THE RISK OF INJURY FROM THE FOREGOING RESTS ENTIRELY WITH YOU. NEITHER SilverStateDrivingAcademy.com NOR ANY OF ITS PARTNERS, AGENTS, AFFILIATES OR CONTENT PROVIDERS SHALL BE LIABLE FOR ANY DIRECT, INDIRECT, INCIDENTAL, SPECIAL OR CONSEQUENTIAL DAMAGES ARISING OUT OF USE OF THE SERVICE OR INABILITY TO GAIN ACCESS TO OR USE THE SERVICE OR OUT OF ANY BREACH OF ANY WARRANTY. YOU HEREBY ACKNOWLEDGE THAT THE PROVISIONS OF THIS SECTION SHALL APPLY TO ALL CONTENT ON THE SERVICE. You agree to indemnify and hold SilverStateDrivingAcademy.com, its partners, agents, affiliates and content partners harmless from any dispute which may arise from a breach of terms of this Agreement. You agree to hold SilverStateDrivingAcademy.com harmless from any claims and expenses, including reasonable attorney's fees and court costs, related to Customer's violation of this Agreement, including the Terms of Service or any Content placed on the Service by you. This Agreement constitutes the entire agreement between the parties with respect to the subject matter contained herein and supersedes all previous and contemporaneous agreements, proposals and communications, written or oral between SilverStateDrivingAcademy.com representatives and you. SilverStateDrivingAcademy.com may amend or modify this Agreement or impose new conditions at any time upon notice from SilverStateDrivingAcademy.com to Customer as published through the Service. Any use of the Service by you after such notice shall be deemed to constitute acceptance by you of such amendments, modifications or new conditions.